entertainment | Wait! What's A Dial? Season two of Hannibal hit the ground running. Quite literally too, as the opening scene was a flash-forward of an intense fight between Hannibal and Jack Crawford. So far, we know that Hannibal is going to get figured out, and the rest of the season is going to be dedicated to seeing how that comes together. 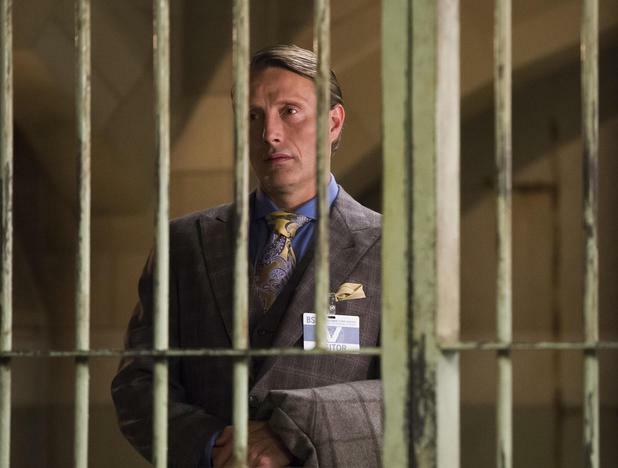 Season two started where season one had left off, Will Graham was framed for all of the horrible things that Hannibal had done and is now imprisoned. Even worse, his new psychiatrist is Dr. Chilton, who is still full of himself even after having all of his organs removed. At this time, only the audience, Will, and maybe Hannibal’s psychiatrist Bedelia Du Maurier know that Hannibal is last season’s big baddie “The Chesapeake Ripper”. It’s unclear, as of right now, what Bedelia knows, but she has made some implications that she knows too much about Hannibal. This season is going to stray away from the first season’s formula of featuring a killer of the week. Instead, they are going to have a “big baddie” which has already been revealed to be Mason Verger, notably played by Gary Oldman in the film adaptation of Hannibal. It isn’t known exactly when Verger is going to show up, but last night introduced an unknown killer kidnapping random people based on the color of their skin. Also the feel of their skin, that was oh so creepily pointed out to the audience when the killer complimented a man’s smooth skin on the subway. Later, this man was abducted and found himself in a room of “dead” people. It’s unclear whether or not they are dead or in heroin-induced comas even though the coma thing has been done before. The last shot of the night revealed that the bodies are arranged in a way to make it look like an eye. Last night at midnight, 20 million DirecTV subscribers lost 17 different Viacom channels. The channels lost include Nickelodeon, Comedy Central, MTV, and more. USA Today reports that DirecTV subscribers who tune into Viacom channels will now see a “mix” channel of programming from other networks, such as Bravo, FX, and TBS. DirecTV is also making eight Encore movie channels, which are usually part of premium packages, available for free to all of its customers until July 31. For more on DirecTV’s side of the argument, check out directvpromise. More on Viacom’s view can be found on the company’s blog and whendirecttvdrops. In 2009, The Jay Leno Show used an amateur comedy video that it had found on YouTube without permission. Despite the fact that Leno did not ask permission, Brian Kamerer and Travis Irvine were initially happy that he had used the video on his show. All that changed when NBC decided to take the duos video down because of copyright infringement. Yes, you read that correctly. NBC, which could be accused of copyright infringement for not paying or asking to use a video, took down the original posting of a video it essentially stole from Kamerer and Irvine due to copyright infringement. I am not saying Jay Leno should not have used the video. In fact, anything that gives more exposure to up-and-coming comedians is a good thing, especially since late night talk shows rarely feature stand up comedians nowadays. However, NBC had no right to use the video without asking permission or compensating Kamerer and Irvine and definitely went to far with taking the video down. CBS unsuccessfully tried to get a court to block the premiere of ABC’s Big Brother-esque reality show The Glass House. While the premiere of The Glass House was only watched by 4.7 million viewers, that hasn’t stopped CBS from sending out a press release that is one big jab at ABC. The Hollywood Reporter reports that 2oth Century Fox has bought the movie rights to Seasame Street. The show has had two other theatrical releases: Follow That Bird in 1985 and The Adventures of Elmo in Grouchland in 1999. The movies were distributed by Warner Bros. and Columbia Pictures, respectively. Tags: 20th century fox, adventures of elmo in grouchland, children's television, columbia pictures, elmo in grouchland, entertainment, follow that bird, hollywood reporter, movies, seasame street, television, the adventures of elmo in grouchland, the hollywood reporter, warner bros.
As a lackluster audition season comes to a close, Monday’s episode of America’s Got Talent needed to leave a great impression. This was no time for awful acts that deserved to be laughed off the stage. This was no time for forgettable acts that would never be heard from again. This episode needed to find possible winners. Unfortunately, as soon as the show opened with an act featuring a pig, this night seemed doomed. It didn’t get much better afterwards. The opening feature package showed a woman excited to show the world her pig’s talent. I could not imagine any talent that this act would show. As it turns out, the pig didn’t really have a talent. She ran into bowling pins seemingly accidentally and squeaked what looked like a bicycle horn with her mouth. The judges didn’t understand it and promptly rejected it. Of course, it wasn’t worth being shown on television at all, so AGT was continuing a problem it has had all season. Both the “No” and the “Yes” montages that followed were just as forgettable. An average singer, some dance groups, and some acts that weren’t made clear got voted through to Vegas. Some bad singers and more variety acts that could never hold anyone’s attention were rejected from going to the next round. The montage sections of the show has been a constant disappointment throughout the auditions. They are supposed to give the viewer a sense of the talent and lack of talent that was found in various cities. They could never do that in two minutes. The montages just ended up being unnecessary parts of each hour. You’ve probably heard that Charlie Sheen is coming back to television with Anger Management, which is based on the movie of the same name. Yesterday, FX released six commercials, each one featuring a punchline from the show. However, they are not really funny because the promos at 10 to 20 seconds each don’t provide any context for the joke. The first commercial is the longest and doesn’t actually have anything to do with the show, except for the fact that it stars Charlie Sheen as Charlie Sheen. At least he gets in a good, albeit overused, joke in at the end. You’ve probably heard about NBC rebooting The Munsters as a one hour drama. Now, Entertainment Weekly reports the show’s name has been changed to Mockingbird Lane, which comes from the family’s iconic address, 1313 Mockingbird Lane. The show will star Jerry O’Connell as Herman Munster, British comedian Eddie Izzard as Grandpa Munster, and Portia de Rossi as his wife Lily. This cannot be a good idea. The Munsters does not belong as a drama. The original show is remembered as a goofy sitcom. It was an alternative to The Addams Family. Mockingbird Lane just seems like NBC’s desperate attempt to cash in on a classic show. The only similarities between the two shows will be the characters names and probably personality traits, since the actors chosen do not look like the original cast members. While Mockingbird Lane may be inspired by The Munsters, there is no good reason for NBC to make such a big deal about the connection between the shows. The two shows will be completely different from each other. I would even argue that it would have been smarter for NBC to change the names of the characters, remove any reference to the original show, and just advertise their unusual new drama, so that people would judge Mockingbird Lane on its own merits and not automatically assume it will be inferior to its 1960s counterpart.